The first is IBM Hyper-Scale Manager, a flexible, consolidated multi-system management application that was originally released in October 2012 as “Multi-System Manager”. IBM Hyper-Scale Manager is based on and seamlessly integrated with the XIV GUI and spans multiple XIV systems. The second new technology, IBM Hyper-Scale Mobility, is the topic of this publication. It is a powerful function for moving volumes between storage containers transparently, with no disruption to host applications. IBM Hyper-Scale helps you easily overcome provisioning scenarios that normally challenge traditional systems. IBM Hyper-Scale can accommodate several critical customer scenarios for data mobility, load balancing, over-provisioning, and storage system repurposing. This IBM Redpaper™ publication provides a broad understanding of the IBM Hyper-Scale Mobility feature. The paper describes the IBM Hyper-Scale architecture and includes detailed step by step scenarios that illustrate the online volume migration process, both from the XIV GUI and the XIV Command-Line Interface (XCLI). 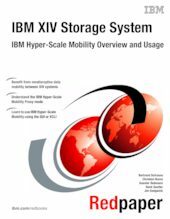 This publication is intended for XIV customers and users who want a practical understanding of IBM Hyper-Scale Mobility concepts and usage.